A Blacklight is a fixture that emits light in the ultraviolet band. People can't see the light itself - you can only see items that interact with it. Special paints and dyes react under blacklights, as well as normal items like clothing, some drinks and even the enamel of your teeth! The technical term for an item interacting with blacklight is called "fluorescence" - but most people call it GLOW! Theatrical blacklights are called by a variety of names - UV Lighting, Blacklights, UV Fixtures and Wildfires. They can be a conventional lighting fixture (using a halogen or incandescent bulb) or they can be LED lighting fixtures. At In Depth Events, we have one of the largest rental inventories available of theatrical black lights for Glow Parties, Disco events and EDM events. Blacklights Will Make Your Event GLOW! Blacklights Light Up the Night! At In Depth Events, we are one of a handful of companies in the United States that have an inventory of long throw, black light fixtures available for rental. Out of this handful, we are in an even smaller minority, as we have the technicians that understand these black light fixtures, the throw patterns associated with them and the ability to use them in large format, outdoor environments. As you can imagine, it takes a very talented, professional technician to focus a lighting fixture that doesn't emit visible light! 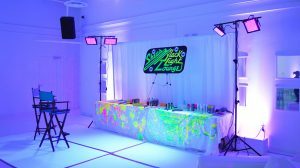 Our blacklight rentals are used all over the nation for 5K runs, theme parties, college parties, video shoots and corporate event rentals. Combined with our LED Dance Floors and special effects rentals, we are the company you need to provide long throw black light fixtures, LED black light panels and LED blacklight PARS! Whether your event is in an indoor venue or an outdoor parking lot, our event professionals can make your audience GLOW! You'll find our technicians to be polite, well-dressed professionals who are passionate about the blacklight rental industry as well as the safety of your attendees and talent. Our event staff is ready to discuss your specific blacklight rental needs and requirements. Ask Us a Question and find out more about our black light rental services and how they can be combined with our stage rentals, rooftop rentals, audio rentals, and special effects rentals. Our staff is ready to work with your outdoor GLOW festival or your indoor GLOW party!